For other uses, see Maltese cross (disambiguation). Cross of the Order of St. John. It is a heraldic cross variant which developed from earlier forms of eight-pointed crosses in the 16th century. 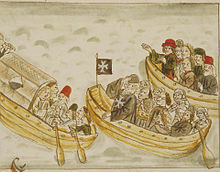 Although chiefly associated with the Knights Hospitaller (Order of St. John, now the Sovereign Military Order of Malta), and by extension with the island of Malta, it has come to be used by a wide array of entities since the early modern period, notably the Order of Saint Stephen, the city of Amalfi, the Polish Order of the White Eagle (1709) and the Prussian order Pour le Mérite (1740). Unicode defines a character named "Maltese cross" in the Dingbats range at code point U+2720 (✠); however, the code point is usually rendered as a cross pattée. The Knights Hospitaller during the Crusades used a plain Latin cross. Occasional use of an "eight-pointed cross" by the order begins in the early 14th century. This early form is a cross moline (ancrée) or cross branchée ending in eight points, not yet featuring the sharp vertex of the modern design. The association of the eight-pointed cross with the southern Italy coastal town of Amalfi may go back to the 11th century, as the design is allegedly found on coins minted by the Duchy of Amalfi at that time. Eight-pointed crosses appear on coins minted by the Grand Masters of the order, first shown embroidered on the left arm of the robe of the kneeling Grand Master on the obverse of a coin minted under Foulques de Villaret (r. 1305–1319) In 1489, the statutes of the oder require all knights of Malta to wear "the white cross with eight points". Emergence of the sharp vertex of the modern "four-arrowhead" design is gradual, and takes place during the 15th to 16th century. The "Rhodian cross" of the early 16th century had almost, but not quite, achieved the "sharp arrowhead appearance". The fully modern design is found on a copper coin dated 1567, minted by Grand Master Jean Parisot de Valette (r. 1557–1568). In 1577, Alonso Sanchez Coello painted Archduke Wenceslaus of Austria as Grand Prior of the Order of Malta wearing the emblem on his robes. The design appears appears again on coins minted in the late 17th to 18th centuries. It is shown on a copper coin dated 1693, minted under Grand Master Adrien de Wignacourt. From the end of the 17th century, it is also occasionally displayed as alternative heraldic emblem of the order. Its depiction on the facade of San Giovannino dei Cavalieri dates to 1699. Early form of the eight-pointed cross (cross fourchée), seal of the provost of St John's church, Stockholm, dated 1526. Ornamental Maltese cross on the ceiling of St. John's Co-Cathedral, Valletta, Malta (Mattia Preti, 1660s). The Maltese cross is displayed as part of the Maltese civil ensign. The Maltese euro coins of 1- and 2-euro denomination carry the Maltese cross. It is also the trademark of Air Malta, Malta's national airline. The Maltese cross was depicted on the two-mils coin in of the Maltese lira,[year needed] and on the reverse of one- and two-Euro coins introduced in January 2008. Tilted Maltese cross of the Order of Saints Maurice and Lazarus, founded in 1572 as an amalgamation and successor of the Order of Saint Lazarus with the Order of Saint Maurice, founded in 1434. Austria's two highest decorations, the Decoration of Honour for Services to the Republic of Austria and the Austrian Decoration for Science and Art, have the eight-pointed cross as their basis. In Belgium, the eight-pointed cross is the basis of two of the country's royal orders of merit, the Order of Leopold and the Order of Leopold II. The Order of Bravery is the highest military decoration of the Kingdom of Bulgaria and of the Republic of Bulgaria and the most esteemed Bulgarian order. The Pour le Mérite, Imperial Germany's highest award for military valor, was a blue-enameled, eight-pointed cross with golden eagles between the arms. It was founded in 1740 by the francophile Prussian King Frederick the Great, and was adorned with the French legend Pour le Mérite ("For merit") in gold. Awards of the military class ceased with the dissolution of the Hohenzollern monarchy at the end of World War I in November 1918. The coats of arms of the former duchy of Mecklenburg-Strelitz and the former Mecklenburg-Strelitz district contained an eight-pointed cross. Several towns in Northern Germany have an eight-pointed cross on their coats of arms, including Malchin, Mirow, Moraas, Rastow, and Sülstorf. Heitersheim and Bad Dürrheim in Southern Germany also have an eight-pointed cross on their arms. In the Netherlands, the eight-pointed cross forms the basic form for the three highest royal orders of merit: the Orders of the Netherlands Lion, Orange-Nassau and the Gold Lion of the House of Nassau. In Norway, the eight-pointed cross is the symbol used in the Order of St. Olav. In the Philippines, the eight-pointed cross is a part of the pendant of the Quezon Service Cross, which is the highest honor that can be conferred in the republic. It is also found in the Order of Sikatuna, and Order of the Golden Heart. In Poland, the eight-pointed cross forms the basis for the country's four highest awards of merit: the Order of the White Eagle, Virtuti Militari, the Order of Polonia Restituta and the Order of the Military Cross. In Portugal, the eight-pointed cross forms the basis for the country's Order of Merit. The cross forms the basic form for some Spanish orders such as the Order of Charles III, the Order of Isabella the Catholic, the Order of Montesa, and the Order of Queen Maria Luisa. In Sweden, an eight-pointed cross forms the basis for all the royal orders of merit: the Royal Order of the Seraphim, Order of the Sword, Order of the Polar Star, and Order of Vasa, as well as the Order of Saint John in Sweden. The eight-pointed cross forms the basis for the design of the Order of the Bath and the Royal Victorian Order. In France, the Maltese cross was the symbol of the Musketeers of Armagnac, the elite military group which supported Louis XIII and Louis XIV. The Musketeers of Armagnac are currently an honorary order ( http://www.mousquetaires.asso.fr/fr) which celebrates the values of the original Musketeers, as well as the elegant brandy from the southwest of France, Armagnac. Flag of the city of Amalfi. The Naval Jack of Italy features the national coat of arms of four of the former maritime republics with the "Amalfi cross" for Amalfi in the lower left. Besides the town of Amalfi which is its namesake, the cross is also displayed on various towns' coats of arms, such as Aicurzio, Rolo, San Giovanni di Gerace, Fasano, Gizzeria, Murello, Rodì Milici, Blufi, Ronchis, San Mauro la Bruca, and the Province of Salerno. Numerous French communes have the eight-pointed cross on their coats of arms. Among them are Drucourt, Eysines, and Valcanville in Normandy; Rimbachzell in Alsace; Saint-Jean-de-Bassel in Lorraine; Rontalon in Aquitaine; Chappes in Auvergne; Arvieu in Aveyron; and Auton and Vinon-sur-Verdon in Provence. Many municipalities and civil parishes of Portugal, which territories were once part of the dominions of the Knights Hospitaller, include eight-pointed crosses in their coats of arms. Among them are Crato, Oliveira do Hospital, Proença-a-Nova, and Gavião. In Croatia, it is on the coat of arms of the town Ivanec, named after the Knights of Saint John. The 14th district of Prague has an eight-pointed cross on its coat of arms. It also appears on the coats of arms of several other Czech towns and villages, including Dobřichovice in Central Bohemia; Doubravice in South Bohemia; Staňkovice in the Ústí nad Labem Region; and Medlovice and Orlovice in South Moravia. The flag, badge, and coat of arms of the state of Queensland feature an eight-pointed cross, and as such, many public services incorporate the cross, including the Queensland police and ambulance services. The eight-pointed cross is part of the coat of arms of the University of Queensland. It is also part of the logo for various ambulance services in Australia, such as the South Australian Ambulance Service, the Queensland Ambulance Service, the Ambulance Service of New South Wales, Ambulance Victoria, St John Ambulance Australia, and the Australian Capital Territory Ambulance Service. The cross known as the Fire Service Star is also used by Country Fire Authority in Victoria as an official symbol. It can be seen on uniform hats and on Long Service and Outstanding Service badges. Two Dutch towns, Ermelo and Montfoort, use the eight-pointed cross on their flags, and the former on its coat of arms, also. Several municipalities in Spain also use the eight-pointed cross on their flags and coats-of-arms, including Alguaire and Amposta in Catalonia, Lora del Río in Andalusia, and O Barco de Valdeorras, Castrelo de Miño, O Incio, Larouco, O Páramo, A Pobra de Trives, Portomarín, and Quiroga in Galicia. The Swedish municipality of Mönsterås uses an eight-pointed cross on its arms. The coat of arms of Bardonnex, in the Swiss Canton of Geneva, displays an eight-pointed cross. The eight-pointed cross appears on the coat of arms of the London Borough of Hackney. The eight-pointed cross appears on the coat of arms of Saint John, one of the parishes of Jersey. In 1967, flight tests were conducted at Fort Rucker, Alabama, to determine the most highly visible and effective way to mark a helipad. Twenty-five emblem designs were tested, but the emblem depicting four blurred rotor blades, referred to as the "Maltese cross", was selected as the standard heliport marking pattern by the Army for military heliports, and by the FAA for civil heliports. However, in the late 1970s, the FAA administrator repealed this standard when it was charged that the Maltese cross was antisemitic. In the United States today, some helipads still remain bearing their original Maltese cross emblems. The eight-pointed cross is also used to identify the final approach fix in a nonprecision instrument approach (one that lacks precision vertical guidance), in contrast to the use of a lightning bolt-type icon, which identifies the final approach fix in a precision approach. St John Ambulance and its national organizations. The Order of Malta Ambulance Corps. The Johanniter-Unfall-Hilfe and the Malteser Hilfsdienst, the respective Protestant and Catholic ambulance services in Germany, have an eight-pointed cross in their emblems. Emergency medical services in Australia. This is due to the role of St John Ambulance, who continue to run the primary ambulance service in some states. The Huguenot cross, a symbol of French Protestants, is an eight-pointed cross with a dove. In Spain, the eight-pointed cross is the symbol used by the military Medical Corps. The football club AJ Auxerre, founded in 1905 by the priest Abbé Deschamps, has an eight-pointed cross as its emblem, adapted from that of the Catholic Association of French Youth. In India, the eight-pointed cross is the symbol used by the Garhwal Rifles and Rajputana Rifles. Det Norske Veritas uses the eight-pointed cross as symbol in the class notifications telling that the ship is constructed under their monitoring. In the Philippines, the eight-pointed cross is part of the school seal of Colegio de San Juan de Letran. It was founded by Don Juan Alonso Jeronimo Guerrero, a retired Spanish officer and one of the Knights of Malta and Fray Diego de Santa María, O.P., a Dominican brother. The eight-pointed cross is used by the Swedish Mounted Royal Guards as their emblem. The eight-pointed cross is the trademark of the oldest Swiss watch manufacturer, Vacheron Constantin. The badge of the British Army's Bermuda Regiment combines the eight-pointed cross of rifle regiments with elements from that of the Royal Artillery. In the United Kingdom, the eight-pointed cross is the symbol used by rifle regiments, and has been incorporated into the badges of virtually all rifle units, including the cap badge of the Bermuda Regiment, officers' cross belt of the Gurkha Rifles and now amalgamated, the Royal Green Jackets. The first postmark employed for the cancellation of the then new British postage stamps in the 1840s was the shape of an eight-pointed cross and named accordingly. The eight-pointed cross appears on the shirts of St Mark's FC (West Gorton), the forebears of Manchester City Football Club. The eight-pointed cross is the insignia of Methodist College Belfast, and it appears on the blazers of the sixth-form pupils as its crest. The eight-pointed cross is also the symbol of Neath Rugby Football Club. It is the symbol of the Royal Shrewsbury School Boat Club, displayed on the oars and uniform of the 1st VIII. It is a symbol used by the ATOC on rail tickets which allow travel on the London Underground between London Rail Terminals (e.g., between Euston and Victoria), when passengers are travelling via London. Alternatively, where the destination of the ticket is a London Travelcard Zone, the inclusion of the cross allows a passenger to undertake one single or return journey to any station within that zone from the London Terminal station at which they arrived. The eight-pointed cross with eagle, globe, and anchor in the center is used for the sharpshooter badge in the United States Marine Corps. Malta Boat Club, a sculling club on Philadelphia's Boat House Row, uses the eight-pointed cross as its logo. Phi Kappa Sigma, an international all-male college secret and social fraternity, uses an eight-pointed cross as its symbol. The Yale University School of Nursing uses the eight-pointed cross on its official shield. The Crossmen from San Antonio, Texas use the eight-pointed cross as their logo. The VFW, a military veteran's organization, uses the eight-pointed cross in its official emblem. In US York Rite Freemasonry, the Knights Templar (Freemasonry) use the eight-pointed cross in the Order of the Knights of Malta. The Military Division of the Kappa Alpha Order, composed of members serving in or honorably discharged from the U.S. Armed Forces, uses an eight-pointed cross in the colors of The Order. The "Maltese cross flower" (Lychnis chalcedonica) is so named because its petals are similarly shaped, though its points are more rounded into "heart"-like shapes. The flower Tripterocalyx crux-maltae was also named for the Maltese cross. The Geneva drive, a device that translates a continuous rotation into an intermittent rotary motion, is also sometimes called a "Maltese cross mechanism" after the shape of its main gear. Eight-pointed crosses have been adapted for use in the cross of Saint Lazarus[dubious – discuss] and as part of the flag of Wallis and Futuna. It has been the official badge (combined with an ellipsoid in the center) of the Delta Phi Fraternity since 1833. A similar cross is also used by the Veterans of Foreign Wars organization. A variant of the Maltese cross, with three V-shaped arms instead of four, was used as the funnel symbol of the Hamburg Atlantic Line and their successors German Atlantic Line and Hanseatic Tours in 1958–1973 and 1991–1997. A five-armed variant is the "Cross" of the French Legion of Honour (Croix de la Légion d'honneur). A seven-armed variant, known as the "Maltese asterisk", is used as the basis of Britain's Order of St Michael and St George. Other crosses with spreading limbs are often mistakenly called "Maltese", especially the cross pattée. The royal warrant which created the Victoria Cross prescribed a Maltese cross, but the medal has always in fact been a cross pattée. The official symbol of the Alpha Tau Omega fraternity is the cross pattée, though the organization's founder thought it was a Maltese cross when the organization was formed in 1865. The Nestorian cross also is very similar to both of these. The cross of Saint Florian, patron saint of firefighters, is often confused with the Maltese cross (for example, the New York City Fire Department so calls it); although it may have eight or more points, it also has large curved arcs between the points. The Philadelphia Fire Department, among others, incorporates the St Florian cross into its insignia, as does the International Association of Fire Fighters. The Maltese cross should not be mistaken for the George Cross, awarded to Malta by George VI of the United Kingdom in 1942, which is depicted, since 1964, on the national flag of Malta. 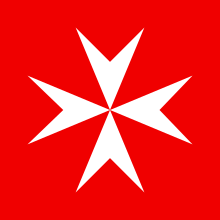 The Maltese cross is depicted on the civil ensign of Malta, shown above. ^ Statutes of 1489 (Stabilimenta Rhodiorum militum), ed. Jyri Hasecker, V&R Unipress (2007). ^ [ Accessed: 6/16/2012 Robert Morris, Coins of the grand masters of the Order of Malta : or Knights Hospitallers of St. John of Jerusalem (1884), p. 25f., plate III. See also: Michael Foster, History of the Maltese Cross as used by the order of St. John of Jerusalem, 2004 (orderstjohn.org)] "The arms Rhodian had almost, but not quite, achieved the straight lined sharp arrowhead appearance, noted from the mid 16th century onwards." ^ p. 38, plate IV, fig 10. ^ a b "The Maltese Cross and its significance" GuidetoMalta.net, History. Accessed 17 July 2013. ^ "The St. John Cross" (PDF). St. John Ambulance Service. Retrieved 2010-07-18. ^ "The Quezon Service Cross". Archived from the original on 31 October 2013. Retrieved 28 January 2013. ^ "Safe Heliports Through Design and Planning" (PDF). February 1994. Archived from the original (PDF) on April 29, 2017. Retrieved June 26, 2018. ^ History and Heritage / Origin of The Maltese Cross Archived 2011-06-04 at the Wayback Machine Accessed 17 July 2013. Wikimedia Commons has media related to Maltese cross. This page was last edited on 23 February 2019, at 00:07 (UTC).